I love Christmas music. I’m not one of those people in November who complains that it’s too early to hear music in the stores or on the radio. I love it. I listen to Christmas songs every now and then throughout the year just because they put me in a good mood. Stuff like Mannheim Steamroller, Trans-Siberian Orchestra, Bing Crosby, Frank Sinatra, etc., I can’t get enough of. One of the best-selling holiday digital singles of all time is easily one of the worst. It was originally meant to be a Mariah Carey track before ending up being sung by Faith Hill. Despite having seen the movie, I didn’t remember this song being a part of 2000’s How the Grinch Stole Christmas, but I’ve always remembered that this song is terrible. 1970’s cheese and kitsch that sounds like it would be right at home in Las Vegas being sung by Wayne Newton. Was the song written for the awful TV movie or was the awful TV movie based on this song? “The Christmas Shoes” is one of the worst songs ever, and easily the worst Christmas song ever. I hate this song with every fiber of my being. It’s so sappy and corny. The kicker is the children singing at the end with the intention of adding even more sentimentality to the song. It only makes me hate it more. The video is hilariously terrible as well: forty-something guy with Hollywood Hogan beard and a wistful look on his face sings while the rest of his band hovers around him solemnly while staring off into the distance or at their feet. I never would’ve known that Ralph Malph from Happy Days released an EP of Christmas tunes if not for Me-TV’s Facebook page posting a link about it. I go into a lot of Christmas albums with an open mind. Most of the year, I’m pretty close-minded when it comes to the music I like to listen to, but I love listening to all kind of holiday releases. I was more than willing to check this release out because I love seeing what new releases there are each Christmas season. As you might have guess by the album’s title, Swinging Down the Chimney Tonight is a jazzy affair. There’s no attempt to be modern here. Each of these classic holiday songs has been given a timeless big band jazz sound. Oh, and Donny Most? This guy is a fantastic singer! He was born in the wrong era! The man is a great crooner and his voice perfectly accompanies these songs, as does Becky Martin who duets with Donny on “Santa Baby” and “C’est Si Bon”. This EP gets a big thumbs up for me and an easy recommendation for anyone that loves Christmas standards and big band music. My only question is… Why did Donny Most wait so long to release something like this?! I’m a HUGE fan of Christmas songs. They are in my head all year-round. In the summertime, I’m on Spotify playing Christmas music. By the fall, it’s virtually all-Christmas songs in my room and in my car. If you don’t believe me, just check out my music blog, Metal Excess, I’ve hardly posted any new reviews at all in the last few months because I haven’t been listening to any hard rock or heavy metal! As much as I love the Christmas carols that we all grew up singing in church, school or around the neighborhood and as amazing as the standards (sung by the likes of Crosby, Sinatra, Ives, Martin, Mathis, Williams, Como and Cole) are, there’s plenty of great modern Christmas songs as well. When I say “modern”, I’m deciding that’s anything from 1990-onward. I think the era of classic Christmas songs runs from the late-1930’s up until the mid-1960’s (“White Christmas”, “Silver Bells”, “A Holly Jolly Christmas”, “A Marshmallow World”, “It’s Beginning to Look A Lot Like Christmas”, etc). Then you have a new wave of classics from the early-1970’s to the mid-1980’s (“Merry Christmas, Darling”, “Last Christmas”, “Wonderful Christmastime”, “Christmas Wrapping”, “Do They Know It’s Christmas?”, etc). Well, without further ado, here are a few of modern holiday classics that receive frequent rotation from me each holiday season! I’ll be breaking this up into two different posts because no one wants to endlessly scroll through a post of YouTube videos. I’m not much of a religious person but there’s something really powerful, haunting even, about this song. Very beautiful. This will be the first time and probably only time (unless she releases another Christmas album) I’ll ever review a Kelly Clarkson album. I actually don’t mind Kelly Clarkson. She’s adorable, seems much more down to earth and girl-next-door than your normal pop star and her songs aren’t terrible and some even have a rock edge to them. I don’t own any of her albums but she’s tolerable. My only issue is she keeps dying her hair blonde! I don’t think it suits her. She’s much prettier as a brunette. Five of the songs here are originals: “Wrapped in Red”, “Underneath the Tree” (which was released as the lead single), “Every Christmas”, “Winter’s Dreams (Brandon’s Song)” and “4 Carats”. They’re all pretty good songs. “Wrapped in Red” has an upbeat 1960s vibe to it. Reminds me of The Ronettes. “Underneath the Tree” is a modern holiday classic that brings to mind Mariah Carey’s Merry Christmas album. “Every Christmas” seems like a modern retelling of “Baby, Please Come Home for Christmas” while “Winter’s Dreams (Brandon’s Song)” is what I call “American Eagle music”. Something that you’d hear playing at hipster stores like Old Navy or Aeropostale. “4 Carats” is a modern pop number. The rest of the album is mostly comprised of old standards that are dusted off by Clarkson’s powerful vocals. We already know these songs are good. The question is always does the vocalist and does the arrangement do them justice? The answer is yes. Everyone else agrees too because the album was a success right out of the gate. It debuted at #3 on the Billboard Top 200 and has already been certified platinum. With Wrapped in Red, Kelly Clarkson has turned in a classy holiday album that I’m sure I’ll revisit over the years. She is truly the only good thing to ever come out of American Idol. 11. What Child Is This? Upon the Winter Solstice is a compilation album that was released exclusively at Kohl’s Department Stores during the 2013 holiday season. 100% of the proceeds go to the Kohl’s Cares charity to support kids’ health and education. Copies can be bought here and for only $5, you can’t go wrong by purchasing some TSO music while helping out a charity. This is not to be confused with the recently released Tales of Winter: Selections from the TSO Rock Operas compilation which covers all five TSO albums and one EP. So far, that’s an album that’s only been released in Europe anyway. Upon the Winter Solstice focuses solely on the group’s first three Christmas releases (known as the Christmas Trilogy): Christmas Eve and Other Stories, The Christmas Attic and The Lost Christmas. Each album is represented with four songs. Some of the band’s most famous tracks like “Christmas Eve/Sarajevo 12/24” and “Christmas Canon” are not included but you still get fantastic numbers such as “A Mad Russian’s Christmas” (one of my favorite TSO tracks), “First Snow”, “What Child Is This?” and “Wish Liszt (Toy Shop Madness)”. 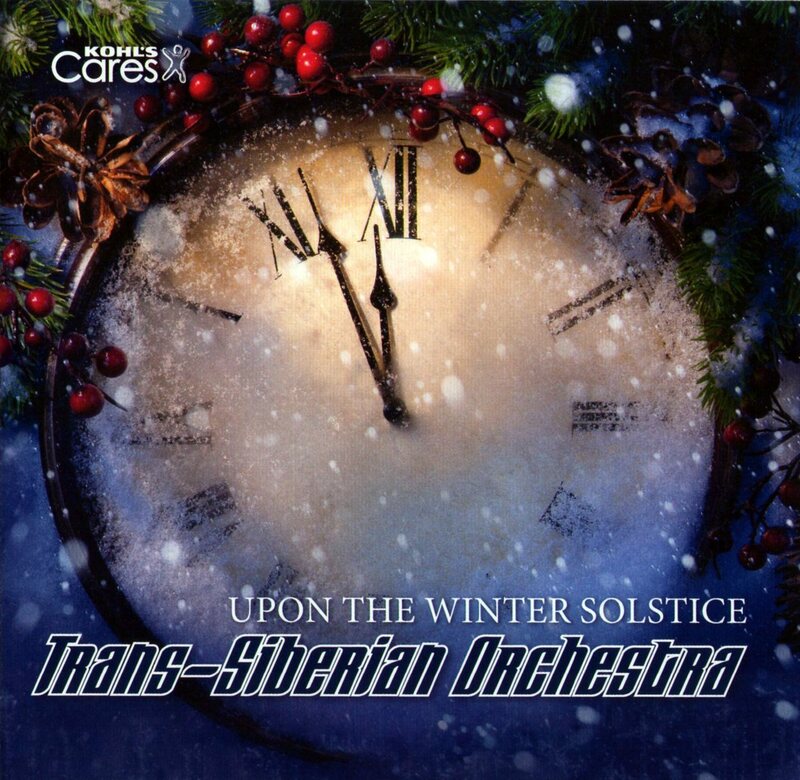 If you’re not familiar with Trans-Siberian Orchestra, this is a great way to get introduced to them while doing some good in the process. This is also a great pick up for someone such as myself who doesn’t (yet) own their first three Christmas albums.